Stamps that honor Martin Luther King Jr. include, clockwise from left, a 1979 Black Heritage stamp, a 1999 Celebrate the Century stamp, the 2013 March on Washington stamp, and Montgomery Bus Boycott, one of 10 To Form a More Perfect Union offerings from 2005. 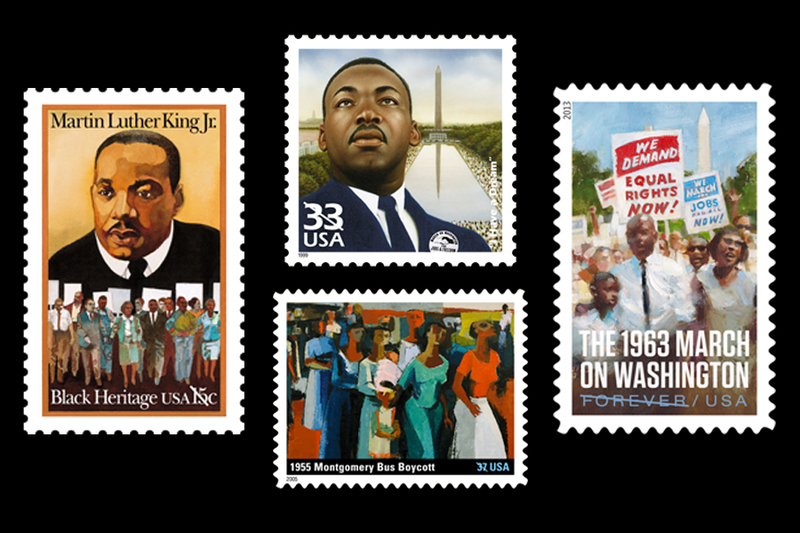 This entry was posted in General Union Business, Postal Attendance Terrorism and tagged American civil rights movement, Black Heritage stamps, federal holiday, Martin Luther King Jr. Day, MLK Day, paid holiday, stamps. Bookmark the permalink.